This post was supposed to come a few days after Christmas, after I had saw Tron: Legacy and re-watched the original Tron. Between family and the holidays, things got pushed back. But I’m finally able to get some time to tell you my thoughts. This isn’t so much of a review as it is just an observation and what I’ve come to know. To first get it out of the way, I liked Tron: Legacy. I really liked it. I saw it the week after it was released and while I initially planned to watch Tron before seeing the newly released sequel, but didn’t get the chance to. This is a good thing. Tron: Legacy updates everything from Tron and makes it seem more stylized and streamlined. They quickly catch you up with a brief retelling of what the universe of Tron is if you haven’t seen the original in the last 20 years or at all. I can honestly say that Tron: Legacy is the best looking film I’ve seen since Avatar. There seems to be a few complaints milling around that the story wasn’t that great and that sometimes the rules set forth in the Tron universe are broken or bent at will to create a more visually striking picture, or make the story work. I will agree with some of that. Tron: Legacy seems to take on the Matrix approach in that it is another world, rather than living inside a computer system. There is rain, homeless people, nightclubs, and more. I’m ok with this. The reason I’m ok with this is because after re-watching the original Tron film, it has to be one of the most boring and unexciting films I’ve seen that my nostalgia seemed to morph into something else. The first Tron film does not hold the test of time well. 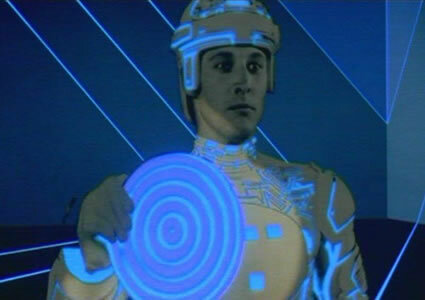 I understand very well that at the time of release, Tron was a marvelous piece of work that integrated computer graphics with live-action cinema. But after actually watching the film again, it reminds me of an early 90s cartoon show. I will give Tron its justice though; it was a very innovative and creative film. I can understand why it did not do well at the theaters and has since become a cult classic. There is not much background for the story, the audience is just thrown in and expected to who Encom is and how all the characters are tied to the company. The audience also loses out by not knowing much about computers and their inner workings. In today’s age, phrases like RAM, ISOs, database, and others are common, at least among tech-savvy enough people. Back in 1982, general audiences were lucky enough to have actually used a computer, let alone knowing what’s inside them or how they work. The story aspect, however, is what really brings me to heart of this post, and a conclusion I’ve come to in the last month or so. Movies are no longer a story-driven experience. They’re main purpose is to serve as a visual medium. If you want a good story, a film should not be your first choice. I’m not saying that all films have terrible story. There are some great films that have released recently that had a good story and unique visuals to back them up (Inception, The Dark Knight, and District 9 are some of the few that stick out in my mind). But this shouldn’t the forerunner if you’re in the mood for narrative. It’s the nature of the medium. Films are told through visuals, therefore, that will be their first consideration. You wouldn’t (or at least you shouldn’t) go to radio, an audial medium, for explosions and car chases. It works both ways. TV is almost in the same boat. You can find some very enjoyable shows but a lot of them are too serialized to consume all the story points and recognize how they work together. So by now you should probably be thinking, where do I go then if I want story? Books, the original medium that started much of what the entertainment industry is today. Good narrative shouldn’t be restricted to 90 to 120 minutes. There simply isn’t enough time to introduce characters, develop those characters, get the audience to care about those characters in some way, introduce conflict, resolve conflict, and conclude in an arbitrary amount of time. Great stories are however long they need to be, whether its ten pages or 300 pages. To also add in gaming aspects, video games, as of lately, have been stepping their game up in terms of story. Almost any game by developer Bioware features narrative that drives the action and gameplay, rather than the reverse. There are more studios getting into this mindset, and this is a good avenue to elevate gaming to new heights. So next time you want to experience an epic story, with deep characters, and striking conflict, see what you can find in a book. You’ll be surprised just how stimulating they can be.